← Will Global Warming Keep Santa Out Of The Midwest This Year? Over the last 15 years, US temperatures have plummeted at a rate of almost eight degrees per century. The only year that alarmists can see is 2012. 2013 will finish colder than its current value, after the big blast of Arctic air coming in this week. This is only true for U.S. temperature. In other parts of the world the trend shows skyrocketing temperatures over the last 15 years (provides no evidence). Actually the Global Temperature over the last 15 years has been nearly flat, but does in fact show a slight decline GLOBALLY. Can you contact me so we can discuss this? I have a few quick questions. Wow… Did you really compile all this NOAA Data into a chart?? 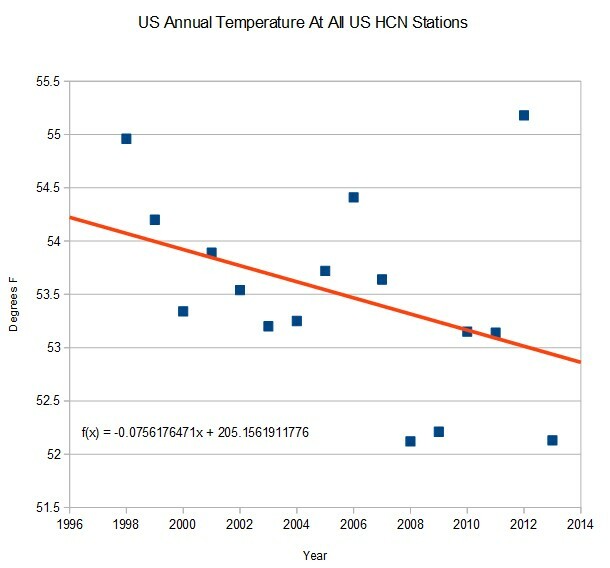 Is this unaltered temp readings from UHCN Stations?… They why do NOAA Charts read so different? They also concentrate on November 2013 which is the hottest ever. db-uk, thanks for puttng that website up. I have just spent an hour or so browsing through the content. In my view, this is an outstanding contribution. Is this another indicator for the next grand minimum?